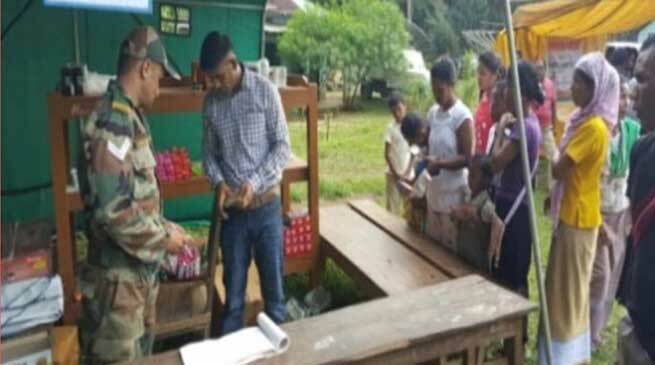 In a series of Medical camps conducted by Indian Army the Dogra Unit of the Red Horns Division conducted a medical camp for the people of village Aradonga and nearby areas which are remotely connected by road and is one of the disturbed and sensitive areas along the Assam Meghalaya border which previously had an abominable reputation due to GNLA sinister activities. The medical camp was inaugurated by Headman of Aradonga village. Three Army medical officers including a lady medical officer from Red Horns Division and three doctors and six nurses from PHC Aradonga did free medical checkup and distributed free medicines to 580 patients. The beneficiary included 154 gents, 365 ladies and 61 children. from approx 10 villages in and around Aradonga. An NGO Shishu Sarthi co-participated by setting up an assessment camp for providing help to children, physically challenged and elderly people of the area. A cultural programme was also embarked upon by locals and school children which also included a performance by Army Band. Army officers also interacted with the youth motivating them about the tangible benefits to Join Armed Forces. The villagers got immensely benefited from the medical assistance and youth got motivated for the upcoming recruitment rallies. The Samaritan Activity by Indian Army paved way for greater harmony between the residents of Aradonga and Army as well as instilled greater tranquillity in the area.